Above: Heads Up® Seed Treatment vs Untreated Soybean Trial – Clear Lake, IA. Dark patches attributed to early die down caused by Soybean SDS. Heads Up® treated beans had a 3.9 bu/a yield advantage over untreated in trial. A New Mode of Action for Enhanced White Mold and SDS Protection Starting at Less than $4/ac. “We are close to the goal of developing an effective and economic method to control soybean sudden death syndrome. We evaluated four biological control products. A product called Heads Up seed treatment, although not a direct fungicidal product, has been proven to cause what is called Systemic Acquired Resistance (SAR) reaction in soybeans. This SAR “toughens” the soybean, helping partially control white mold as well as other diseases in soybeans. IS WHITE MOLD STEALING YOUR YIELD? 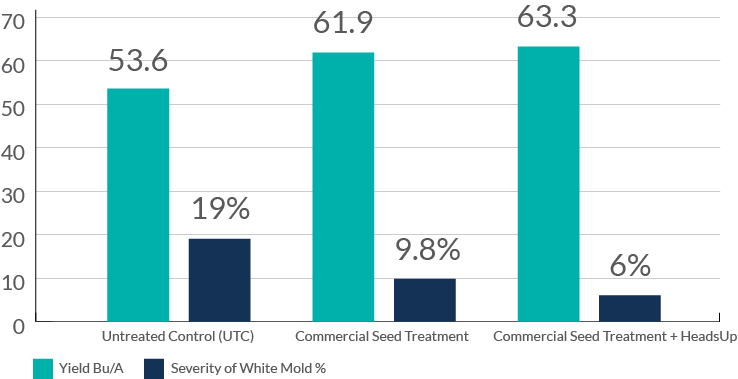 White Mold Stealing Your Yield? Listen to Glenn Herz, Field Research Lead with Hefty Seed Company discuss favourable yield response with Heads Up®.